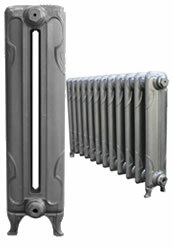 We have the UKs largest selection of Cast Iron Radiators. Therefore we have produced a series of helpful guides to help you in making your decision. Below is a table detailing all of our Decorated or Ornate Cast Iron Radiators with some of the most important details. Decorated Cast Iron Radiators require enormous skill in creating delicate castings and tend to be in the most prominant rooms of houses. They emerged around 1900 when homeowners wanted radiators to be decorative features in their living rooms and not just heat sources. When antiqued, highlight polished or highlight painted - decorated cast iron radiators look sensational. 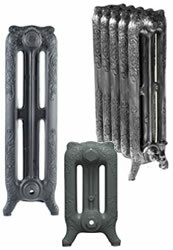 The Sovereign Baroque and Rococo Cast Iron Radiators are the top selling decorative cast iron radiators in the UK. Exquisitly cast scalloped Rococo detail in three columns and delicately cast splayed feet. Historic Edwardian Decorated Cast Iron Radiator design. 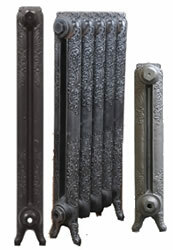 Historic Victorian Decorated Cast Iron Radiator design in a narrow version. Traditional Victorian Cast Iron Radiator Design with daisy or sunflower decoration. Historic decorative Cast Iron Radiators Design with exquisitly cast traditional English rose and acanthus leaves. Beatiful and elegant Victorian Cast Iron Radiators Design with rich cherub and classical decoration. Elegant decorative cast iron radiator featuring acanthus leaves and rich rococo decoration. Tall and think casting, perfect where space is limited. Modern interpretation of the historic Rococo Casting with increased decoration on the end leg sections. 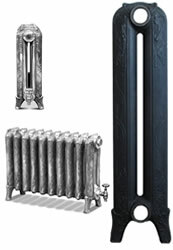 Iconic Gothic Cast Iron Radiator design featuring a lancet arch design and gothic quatrefoils. Modern European Cast Iron Radiator design delicately cast with a stylised juniper floral decoration.